This may not surprise you but in highschool I was not exactly the most popular girl. Don't get me wrong, I had plenty of friends, but we were FAR from the popular crowd.With that said I was very lucky to never have been bullied. However, that is not always the case for children across America. School is hard enough with the added stress that comes with being bullied. I can only hope London won't have to experience any of this when he gets older. 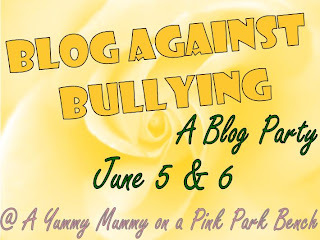 Click on the linky above to help support The Blog Hop Against Bullying. I am so glad you weren't bullied. It's sad how many are. Just be sure to keep talking to that adorable little guy there. My parents never asked how I was going. I agree with Jeanette, my parents never checked. When I was younger I was slightly on the chubby side and got picked on a bit, but then had a growth spurt and pretty much became a quiet person that only talked to select people. Prevent Current Bullying Behavior and Stopping Future Bullying Behavior. First, if you want to stop future bullying behavior, you must prevent it, not react to it. Second, if you want to prevent current bullying behavior, you must be able to define the behavior that leads to bullying in a clear and clinical way, so that you can recognize and respond to this behavior in order to prevent it. The Aggression Continuum, which illustrated the origins of aggression through its ultimate expression of violence; is the only means to accomplish these two very important objectives. It is really that simple! Thank you so much for participating and for donating! I'm so glad you were never bullied and I hope you're son never has to experience it either.